The basic laws of thermoelasticity, similar to those of the theory of elasticity, include the equations of motion, the compatibility equations, and the constitutive law. 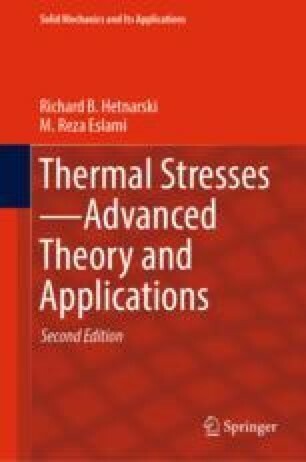 This chapter begins with the derivation of the basic laws of linear thermoelasticity, where the linear strain–displacement relations are obtained, following the general discussion of the Green and Almansi nonlinear strain tensors. The necessity and sufficiency of the compatibility conditions for the simply and multiply connected regions are presented for three-dimensional conditions. These conditions are then reduced to the two-dimensional case called Michell conditions. The classical general and simple thermoelastic plane strain and plane stress formulations are presented.